Summer brunch for a crowd can be a bit daunting. All those dishes, many which have to be served hot to be their peak deliciousness (we’re looking at you, eggs), and all done in the morning when many of us are not at our most efficient. Having some make-ahead casseroles in your repertoire can make brunch life much more manageable but can also get a bit boring. Your basic baked eggs or hashed brown casseroles are delicious but rather typical. What if you want to make something with a bit more pop, something your guests might not have seen before? Everyone loves a cheeseburger. Especially at brunch. There is something that feels a bit naughty about having a cheeseburger as your first meal of the day, in a really good way. But if you are hosting a brunch, you don’t want to have to deal with manning the grill while your guests are Bloody Marying without you, and prepping a burger topping bar first thing in the morning can make the most practiced host feel overwhelmed. 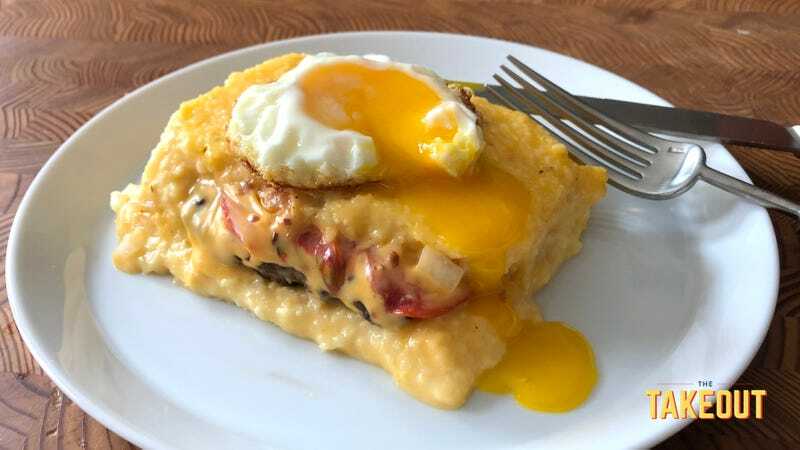 Welcome to your new favorite brunch dish: cheeseburger grits casserole. By placing pre-cooked burgers and classic burger toppings between two layers of cheese grits, you get the best of all worlds. All the fun and flavor of a cheeseburger, in an easy make-ahead casserole, with grits that enhance the brunch feel. It is your starch and meat all in one, so you can serve it alongside a bowl of scrambled eggs, or if you are super fancy, you can make a batch of fried eggs to place on top. And you can adjust the burgers to turkey or even veggie depending on your crowd. Plop a bottle of ketchup, a jar of mustard, and some hot sauce on the table, maybe some ranch if you are really feeling saucy, and relax with your guests. Preheat the oven to 350 degrees Fahrenheit and grease a 9-by-13 inch casserole dish with butter or nonstick spray. Bring water, milk, and salt to a boil over high heat in a large saucepan, then whisk in the grits. Reduce heat to medium-low, and cook according to package directions until the grits have fully absorbed the water and become creamy and tender when you taste them. Remove from heat and stir in the shredded cheddar cheese, mixing until it is fully incorporated into the grits. Pour half of the grits into the bottom of the prepared casserole dish, and set the rest aside, covered, to keep warm. Place the cooked burgers in an even layer over the grits. Add the first eight slices of cheese, one each atop each patty, then a slice of tomato, and then the rest of the cheese slices. Sprinkle the onion and bacon in even layers over the whole dish, then carefully spread the remaining grits over the top of the filing. Bake for 40-50 minutes until a meat thermometer registers 160 in the middle, then let rest for ten minutes before cutting. Serve hot in squares, with an optional fried egg on top.